Immigration appeals may be brought to either the Immigration Appeal Division of the Immigration and Refugee Board or to the Federal Court of Canada. The Immigration Appeal Division hears and decides the outcome of appeals on Canadian immigration matters, such as appeals from refused sponsorship applications, or appeals as a result of removal orders made on grounds such as criminal inadmissibility. In other cases, appeals may be made to the Federal Court of Canada for judicial review. Under Canada’s immigration law, the Federal Court of Canada can be asked to review decisions made by immigration and CBSA officers or decisions made at detention reviews, refugee hearings, and appeals in the Immigration Appeal Division. Only a lawyer can appear for you in the Federal Court, Immigration consultants cannot represent you in that court. The first stage, known as the “leave” stage, sees the Court review the documents related to the case. It must be made evident to the Court that an error was made in the decision, or that the decision was not correct or reasonable. 1. If “leave” is granted, the process moves to the second stage, known as the “application for judicial review”. The applicant in question and his/her lawyer can attend an oral hearing before the Court to argue that the original decision was wrong. In all appeal cases, our federal appeal lawyers ensure all the necessary papers are meticulously prepared with timely disclosure to the respondent and the court/tribunal. In the Immigration Appeal Division, it is critical the appellant is thoroughly prepared for his/her hearing. 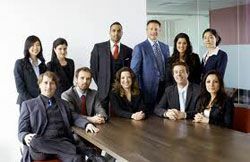 NLC Lawyers is a law firm based in Brampton, Ontario. Our divisional, federal appeals lawyers serve across the Greater Toronto Area including Brampton, Orangeville, Fergus, Arthur, Guelph, Milton, Mississauga, Ajax, Hamilton, Markham, Scarborough, Toronto and surrounding areas.